"If you have a yard or even just a porch box or a pot in a sunny window, grow something to eat in it. Make a little compost of your kitchen scraps and use it for fertilizer. Only by growing some food for yourself can you become acquainted with the beautiful energy cycle that revolves from soil to seed to flower to fruit to food to offal to decay, and around again. You will be fully responsible for any food that you grow for yourself, and you will know all about it. You will appreciate it fully, having known it all its life." Remember, you don't need a huge yard or a traditional garden space to grow your own food. Find any spot with some sun and a little soil (this can be a container, of course) and you can grow some food. Don't have much sun? Grow a little lettuce, arugula, kale or chard. These don't need as much sun as a tomato, and will make you feel very successful. Need more of Mr. Berry's inspiring words? Read more of his thoughts on The Pleasure of Eating. I had a wonderful time in the Twin Cities these past few weeks, speaking to lots of enthusiastic gardeners about edible landscaping. It was great meeting so many of you and discussing ideas for your gardens. If you weren't able to join me, or if you would simply like to see some inspiring photos, here is a copy of one of my presentations for you to peruse. 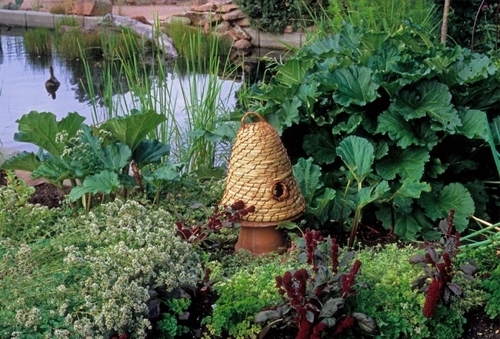 Hope you get some ideas you can use in your garden this year. Also, if you didn't have a chance to pick up a copy of The Edible Landscape and have it signed while I was in town, you can order a copy right here. I'll sign it for you and you'll have it in your hands in just a few days. Look over on the right side of this page for ordering info. Thanks again to all of you who joined me to talk about edible landscapes these last couple weeks. I had an absolute blast! If you've read my book, you might have noticed a glaring omission: I don't mention rhubarb...at all. (At least not that I remember.) Well, I have a confession to make. I've been holding out, but now is the time to admit...I have never grown rhubarb. It's true. I've lived in the Midwest most of my life, and for some unknown reason it has never shown up in a garden I've tended. For my own part, that's probably because A) I've never lived in one place long enough to reap the benefits or B) the places I've lived haven't really lended themselves well to this perennial mainstay (an apartment, a houseboat, and now a National Park). That said, I love baking with rhubarb, so I am often the happy recipient of colorful stalks from friends and family. Rhubarb's beautiful red petioles, about to join strawberries in a delicious baked crumble. Photo from grit.com. Now, if you're a Midwestern gardener, there's probably little I need to say to convince you that rhubarb is a great plant for the home landscape, because it's most likely already there (and has been for generations, or has followed your family from house to house if the stories I hear are true). So I'm writing this to convince myself as much as anyone else (although living in a National Park I won't be planting it in my yard any time soon - they have rules about things like that). Rhubarb is the perfect perennial for the Northern garden because it pops up before just about anything else in the spring, and it actually loves cold temperatures. The Michigan Bulb Company says this to describe 'Victoria' rhubarb: "Thrives best in regions with cool, moist summers and winters cold enough to freeze to a depth of several inches." Music to my Northern ears. Rhubarb will grow in just about any soil, can handle some shade, has very few pest problems, is harvested in June while most other garden plants are just getting going, and will produce for years and years. What's not to like? What's more, it's a great space filler, and looks spectacular. It is distinctly reminiscent of Swiss chard with it's large glossy leaves and deep red petioles, so naturally I'm a fan. Rhubarb makes a great mass planting in the landscape. There's a lot of green in those big fleshy leaves, so add some color with bright ornamentals, or keep it subtle by combining rhubarb with various greens and other deep hues. You don't necessarily need bright color to make things interesting. Harmonious and subdued colors are pretty dang classy, as you can see here. Famed edible landscaper Rosalind Creasy captured this lovely rhubarb combo at the Denver Botanical Garden. Great subtle mix of rhubarb, oregano, parsley and amaranth. There are countless sources on growing rhubarb, and they're pretty straightforward because it's just about the easiest perennial to grow. Check out a few of these sources if you're just getting started. It's not too late to get rhubarb started this year. It needs a year to grow before you start harvesting anyway, so pick a big empty spot in the garden and get some in there. 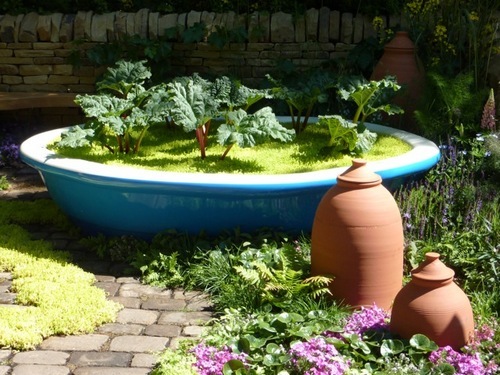 And if you're a bit limited on space as I am, take a look at the links below that talk about growing rhubarb in containers. There aren't a whole lot of people talking about this, but I'm getting some started this season in a couple large containers to give it a try. Overwintering potted perennials is always the tricky part because they need to get cold to enter dormancy, but could be damaged because the roots are basically exposed to air temperature. I have access to a cold cellar space which could prove to be perfect for overwintering potted rhubarb. I might also try wrapping one of my rhubarb containers with some straw and burlap. I'll let you know what happens. Now that's a big container. Photo borrowed from The Enduring Gardener. 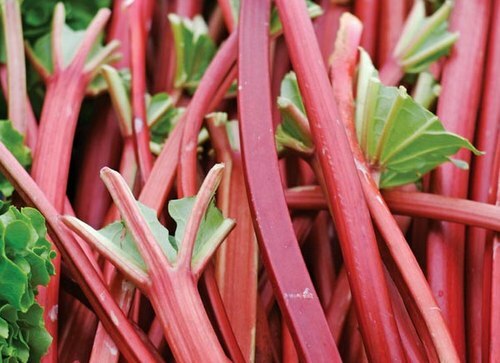 Have you grown rhubarb in a container? Got any tricks? Leave a comment if you're willing to share your secrets. 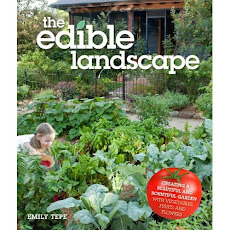 Have you been looking for a copy of The Edible Landscape and finding it is not available? Here's the deal folks...it seems the first printing of my book sold out way faster than my publisher expected - hooray for me, but not for you. The second printing is on its way, but won't be available until the end of April. If you can hold out till then, you'll be able to get your copy at all the usual big retailers. Put in your order soon, because the second printing is already 50% sold! Even my stock of books is dwindling fast, so if you just can't wait until the end of April for your copy to arrive, pop on over to the right side of this page and click Buy Now and you'll be able to place your order quickly and easily. Be sure to choose whether you want your copy signed or not. If not, don't worry, I shall take no offense. I receive order notifications instantly, so your book will be in Priority Mail within a few hours of placing your order, and in your mailbox 2 or 3 days later. How's that for fast? Whether you order from me or wait till the next printing is available, I am just thrilled that you're interested in this book and this great way of gardening.The more of us who start working edibles into our landscapes, the more we'll start seeing food plants everywhere - back yards, front yards, from the tiniest balcony to the grandest estates. All providing delicious fresh food for our families, friends and neighbors. And the more we all get accustomed to these plants being attractive and really adding to the beauty of the landscape, the more they'll start showing up in commercial landscaping where they might feed employees, and of course in schoolyards where they'll feed our kids. Let's get this thing going. Edibles everywhere! Egads! I just noticed that the links on the growing fruit page were outdated. I have just updated them all, so you should now be able to get to those resources with ease. I'll be going through the blog over the next couple of days, checking links and updating. Please, if you notice any bad links, leave a comment and I'll take care of it right away. ...or at least start thinking about it. If you're looking for inspiration for this year's garden there are two events coming up you won't want to miss. And as you might suspect, I'll be speaking at both of them! This Saturday, March 9 is the East Metro Spring Fling in Woodbury, MN. This one required pre-registration, but there might still be space available, so if you're interested it would be worth checking in with them. Next Saturday, March 16, in Cambridge, MN (just north of the twin cities) is Burst Into Spring, hosted by the Isanti County Master Gardeners. Both events should be lots of fun and promise to offer tons of info and inspiration for your garden. I'll be speaking and selling/signing books at both events, so come on out! We have two chances to meet this weekend! I'll be at Cooks of Crocus Hill in Stillwater, MN on Saturday from 11-1, signing books and answering questions. Then, on Sunday from 1-3 I'll be at Egg|Plant Urban Farm Supply in St. Paul. You'll need to sign up for this event, so check out the E|P website for more info. ©2013 Emily Tepe. Simple theme. Powered by Blogger.